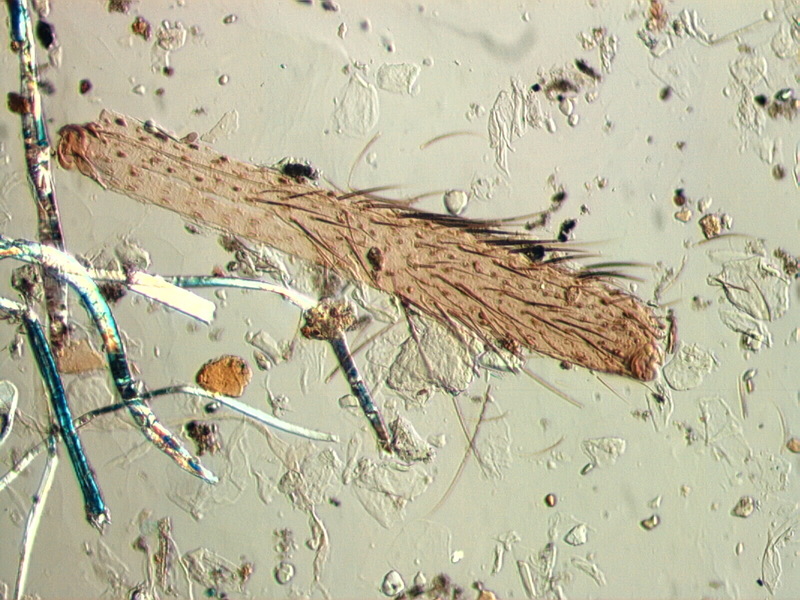 This lower section of the spider's leg shows the setae (hairs) of the leg and their circular Attachment. Oblique illumination makes the human skin flakes in this field of view easy to detect and identify. They are the colorless, equant flakes in the background that are dark on the left margin (away from the light) and light on the right margin (toward the light) of the particle. There are a number of other particle types in this sample including paper fiber, clothing fiber, natural minerals, pollen grains, and more. There is one triporate pollen grain just above the right-center of the spider leg particle. The paper and clothing fibers are on the left of the field of view. This is one field of view from a tapelift collected in a home.